The Inuit and their ancestors made extensive use of Labrador's natural resources before contact with Europeans in the late 15th and early 16th centuries. Much of their culture was oriented toward the sea and its resources. Marine mammals, fish, and seabirds were important food sources and provided oil for fuel, as well as skin, bones, teeth, and other materials for the fabrication of clothing, shelter, weapons, tools, and other utensils. Caribou and other land mammals were also key components of Inuit survival, as were trees, stones, edible plants and other terrestrial resources. Ancestors of the modern-day Inuit initially inhabited only the northernmost reaches of Labrador, such as Killiniq (formely Killinek) and Staffe Islands, but by the end of the 16th century had migrated down the coast to regions south of Nain. Archaeological evidence has uncovered settlements at such places as Saglek, Nain, Hebron, Okak, Seven Islands Bay, and Home Island. Illustration by Tina Riche and Duleepa Wijayawardhana, ©1998. The Inuit moved seasonally to harvest different resources as they became available and used various types of transportation. 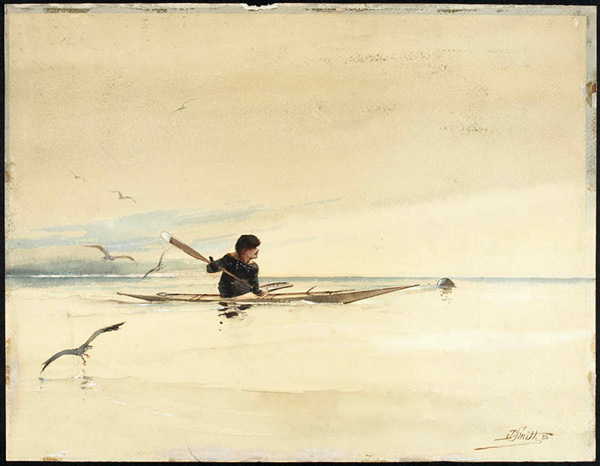 Skin-covered boats, known as kayaks and umiaks, were used in the warmer months, and wooden dog sleds, or komatiks, in the winter. The Inuit used stone, bones, and ivory to make blades for harpoons and other weapons, which they used to hunt marine and land animals. Depending on the season and type of activity they were engaged in, the Inuit lived in pit houses, tents, or igloos. Animal skins provided effective coverings for many shelters, as well as fabric for the manufacture of boots, leggings, parkas, mittens, and other types of clothing. Although the Thule are named for a district in Greenland where archaeologists first uncovered their remains, they were originally an Alaskan people who migrated into the Canadian Arctic about 1000 years ago. From there, the Thule spread east to Greenland and south to Labrador, which they reached between 1250 AD and 1450 AD. The Thule initially inhabited only the northernmost reaches of Labrador, such as Killiniq (formely Killinek) and Staffe Islands, but by the end of the 16th century had migrated down the coast to regions south of Nain. 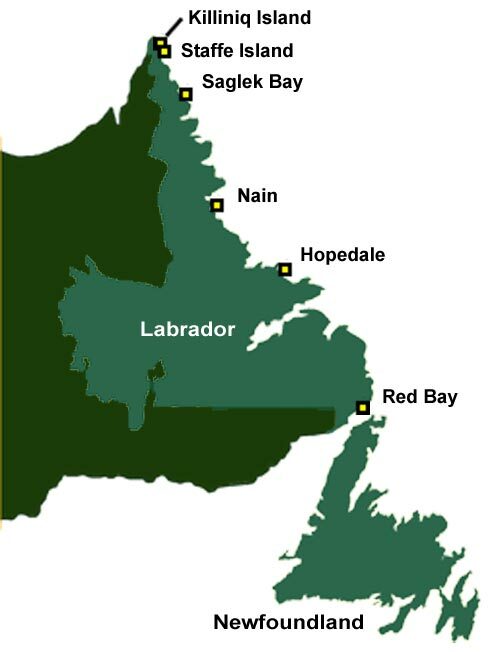 Archaeological evidence indicates they inhabited primarily coastal regions, settling at such places as Saglek, Nain, Hebron, Okak, Seven Islands Bay, and Home Island. The Thule were a marine-oriented culture and obtained much of their diet from the sea. Marine mammals – whales, seals, and walrus – were particularly important because they not only provided large quantities of food, but also skins, oil, tusks, and bones. Hunters used harpoons of varying sizes to catch these animals and fashioned sharp blades from bones, ivory, and stones. They sometimes caught sea mammals on land or through the ice, but often pursued them by boat using either a small one-person kayak or a larger umiak able to hold up to 20 hunters. The Thule built the frames of both vessels out of wood or walrus ribs and other bones, which they then covered with animal hides. Both the Thule and Inuit travelled by single-person kayaks and larger umiaks, holding up to 20 people. They covered both vessels with animal hides and framed them with wood or walrus ribs and other animal bones. Watercolour by D. Smith. Courtesy of Library and Archives Canada (R9266). Fish and seabirds were other important maritime resources. Hunters usually caught seabirds in the winter and early spring and fished for char, trout, cod, salmon, and other species when in season. They made fishing lines and bird snares from whale baleen and also built stone weirs (underwater fences or dams) in rivers and streams to corral fish before catching them with spears. The Thule turned to the land for food as well, exploiting both its animal and plant resources. Caribou were particularly important because a single animal yielded large quantities of meat and also provided skins, bones, and antlers for the manufacture of clothing, kayaks, weapons, and numerous other items. The caribou hunt took place in the late summer and early fall, when the animals were plump after a season of grazing and bore thick fur ideal for making winter clothes. The Thule drove small groups of caribou into lakes or rivers, where hunters killed them with bows and arrows or with lances. In times of scarcity, when sea mammals, fish, and caribou were not readily available, the Thule turned to fox, mussels, and other available sources of protein. They also consumed local plants and berries, but these likely formed only a very minor part of the Thule diet. Because most food sources were only seasonally available, the Thule often stored caches of whale, seal, and caribou meat under rocks in the summer and fall for consumption in the late winter or times of hunger. Precontact Inuit lived in a variety of structures, depending on the time of year and type of activity they were engaged in. They built all of their dwellings themselves with materials gathered from the physical environment. During the summer, they lived in conical tents framed with wooden poles and covered with the hides of seals, caribou, or other animals. The coverings were weighted down along the ground with large rocks. The Thule dug pit houses into the ground during the colder months, which they framed with wood or whale bones and covered with sod and animal skins. Large stone slabs covered the floors and piles of furs served as bedding. A long U-shaped tunnel served as an entranceway and prevented warm air from exiting and cold air from entering. A soapstone lamp burned sea-mammal oil inside each pit house for warmth and light. Another winter dwelling was the igloo, or snowhouse, which served as a temporary shelter for Thule people when travelling or away on hunting expeditions. Builders used bone knives to cut large snow slabs, which they then piled on top of one another in a spiral pattern to form a dome-shaped shelter. Thule women made a wide range of clothing from animal hides, which they sewed together with caribou sinew. Although they could make clothing from a variety of skins, including those from mammals, birds, and even from fish, the Thule valued seal and caribou hides above all else. Sealskin was waterproof and ideal for boots, while caribou skin made excellent leggings and coats. During the winter, many Thule wore a double layer of clothes – the base layer was worn with the fur pressed against the skin, where it formed pockets of warm air, while the outer layer was worn with the fur facing outside for additional protection from the elements. The Thule manufactured many other items from the natural resources they harvested. They made wooden dog sleds that had whalebone runners and sealskin harnesses, as well as kayaks and umiaks that were framed with wood or bone and covered with animal skin. Wood, antler, bones, ivory, and various stones provided the raw materials for harpoons, spears, and other weapons, as well as a wide range of tools and utensils – soapstone pots, slate knives, antler snow goggles, and wooden or bone children's toys. The Thule were an innovative and self-sufficient people, skilled at hunting and gathering, building shelters, tailoring clothes, and manufacturing a wide range of items with materials gathered from the physical environment.